Ben Stokes grabbed the last two wickets on the fifth day to steal the limelight and help England triumph over the hosts Bangladesh at Zahur Ahmed Chowdhry Stadium in Chittagong. The New Zealand native unveiled his true colors in Chittagong as he not only delivered with the bat but also claimed six wickets in the match. As a result, he bagged the Man of the Match accolade from the first of the two-match Test series in Bangladesh. On the fifth and final day of the epic encounter between the two sides, the 25-year-old picked up his fifth and sixth wicket of the match and sealed the victory. He finished the match with a total tally of 103 runs and six wickets. 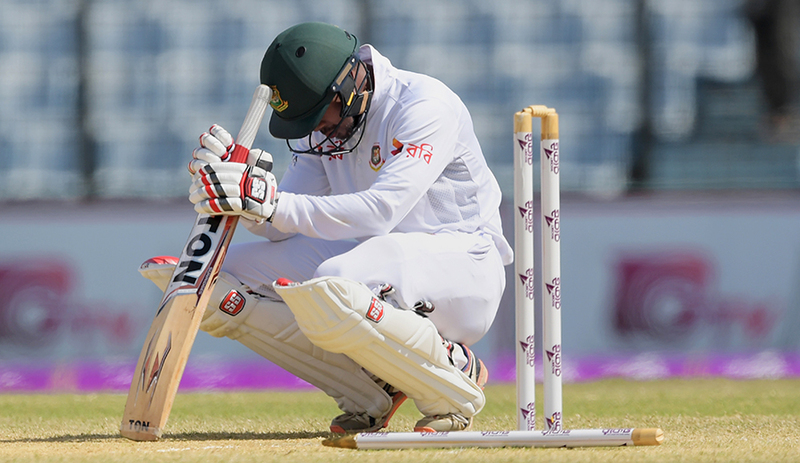 Bangladesh needed just 33 runs on the final day as they resumed at 253. However, they were short of wickets as they lost eight players in the second innings. The star of the home side Sabir Rahman was the only one left on the crease with 64 runs not out by the end of the match. Stuart Broad started his spell with the first over of the match on the fifth day. He continued his form from the nine-over spell from the fourth day. Sabir held composure and started confidently in the final. However, Taijul Islam failed to click against Stokes’ short ball. Shafiul Islam, on the other hand, managed one ball off Stokes. However, he was dismissed in a similar fashion by lbw, awarding England 22-run victory. England was in good condition from the start of the five-day match despite losing their openers Alastair Cook and Ben Duckett early in the match. Joe Root stepped up and posted 40. Furthermore, Moeen Ali and wicketkeeper-batsman Jonny Bairstow hammered the fifties as England registered 293 runs from the first innings. The 18 year old debutant, Mehdi Hasan was the star in the bowling side as he grabbed six wickets and gave away only 80 runs from 39.5 overs. Shakib Al Hasan and Taijul Islam each managed a pair. The home team made a fitting reply to this as Tamim Iqbal jolted down 78 runs from 179 balls. However, none of the other batsmen were able to grab a half-century. Bangladesh was eventually totaled at 248 with Ben Stokes brushing off the tail-enders. The England star also got the crucial wicket of the captain Mushfiqur Rahim who was just two short of bagging his fifty. The lad from Christchurch picked up four wickets after giving away only 26 runs in this innings. Moeen Ali, on the other hand, claimed three victims despite leaking 75 runs from his 22-over spell. In the second innings, the Canterbury star was the only one performing at the batting end. After the top order failed, Stokes posted a brilliant 85 off 151 balls and helped his side to post 240 runs. Bairstow also carried his momentum and managed 47 runs in the innings. Shakib proved his class in the second innings after recording a five-wicket haul whereas the new sensation of Bangladesh managed only a single wicket. In the batting end, Ali got the better of Tamim early in the match. The skipper managed to re-ignite winning hopes for the home side along with Sabir but he lost the race after 39 runs. After bagging the match, the winning skipper praised the Bengal Tigers for a brilliant display of cricket. He was delighted with the result and the performances of his players. Cook stated in a post-match interview, “It was a really good Test match, to think we were here on day five with that wicket. It was such a tight game, so credit to both sides. I’m glad we held our nerve, the quality we have in our attack, we got it reversing. We also had the option of the new ball, which we could use with the spinners. It would have been a gamble but it was quite hard to bat against the new ball. It was a great match and we want to thanks our loyal 10-15 supporters up there. [Stokes?] Not a just ball in hand but the way he batted, he balances the side. Those cricketers don’t come around very often and he’s got an enormous heart as well. A seriously good cricketer.